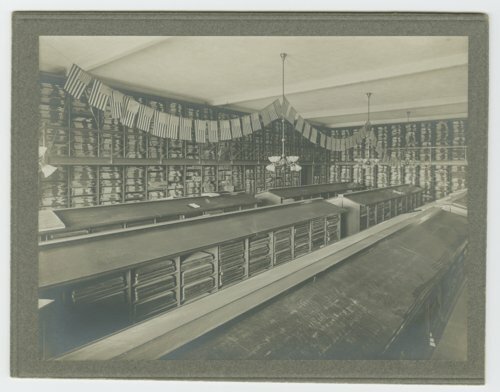 These two sepia-colored photographs show the Kansas Historical Society's newspaper stack and sorting room, located on the east side, of the south wing of the state capitol in Topeka, Kansas. The society was founded in 1875 by the Kansas Editors' and Publishers' Association with the purpose of maintaining and preserving the state's history. For nearly forty years the society was housed in the capitol building until moving across the street in 1914 to the Memorial Building.